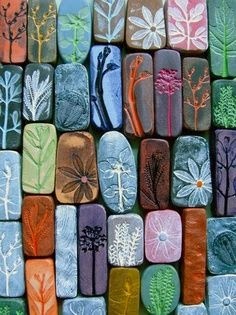 Found this cool clay art project online and I'm thinking of doing this myself at home. I think it's pretty easy. You just have to collect leaves and flowers of different shapes and lay them on top of the clay. Pressed these leaves and flowers against the clay to form their shapes. Best to use as magnets! I haven't done any clay art yet actually but I've seen some who's much into clay art and I think it's pretty interesting. Given a choice, I prefer to have my own art work displayed in my house rather than store brought art pieces. I didn't have a luxury of time though and would just settle for doing some once in a while. This hobby can even help you save few bucks as art works that can be bought from shops are quite expensive. I really like to practice frugal living. You will reap all the fruits of your labor in the end by being frugal. Doing things as a hobby and being able to save money out of that hobby means a lot for a home maker like me.